We begin with the character of Cilydd, an ordinary middle-aged man facing a slightly extraordinary problem. After a trip to the local supermarket, his wife Goleuddydd, fiery, temperamental and very heavily pregnant, has… well, vanished into thin air. CCTV shows nothing, and the police are unable to help, so Cilydd turns to his cousin Arthur, a private investigator, for help in unravelling the mystery. Eventually, there is progress in the case, and poor Cilydd has to face up to some bad news. The hapless Cilydd is a man completely out of his depth in a sea of unlikely occurrences, with his only possible ally being Arthur, a private eye of Dirk Gently proportions and someone who definitely has more to him than may first meet the eye. As Cilydd stumbles from one surprise to the next, the reader becomes just as eager as he is to learn the full truth of what has happened. When we do, it all begins to make sense – even more so on a second reading. This all makes for an intriguing novel, one which I devoured in a few hours, before reading it again more slowly a few days later, but there is a lot more to The White Trail than there would appear from just an outline of the plot. The book is actually a retelling, or reimagining, of a mediaeval Welsh folktale, Culhwch and Olwen, one of the eleven stories making up the Welsh-language collection of myths, the Mabinogion. Seren Books have commissioned contemporary Welsh writers to produce their own versions of the classic stories, and there will eventually be eleven of these New Stories from the Mabinogion. The White Trail is being released in October (along with another book, The Prince’s Pen), bringing the number of books released so far to six. 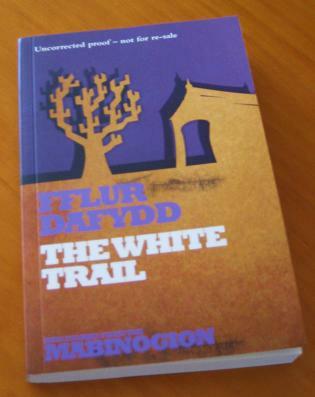 Dafydd, while taking inspiration from the original, has shifted the focus somewhat in her version, making Cilydd the main focus of the reader’s attention and concentrating on the way he copes with the disappearance of his wife. You don’t have to take my word for that though – the writer tells us that herself. You see, another wonderful feature of this book, in addition to a short summary of the original Culhwch and Olwen, is an ‘Afterword’ (like an introduction, but at the end) by the author, in which she tells us about her experiences with the Mabinogion and the process she went through in adapting the myth to a modern story. In this, Dafydd explains why she decided to shift the attention from the young lovers featured in the original to the glum Cilydd, and details some of the similarities and differences between the two versions. I'm definitely one of that group of “will want to read” was interested in the mythology & then you went & threw in Murakami, this then ratchets up the interest of what sounds a really intriguing book in its own right + it's part of a series of books based on the welsh cycle of myths that also predates the arthurian legends. What's not to like. I was sent a review copy of this last week. You've certainly made it sound more appealing (but any review that adds Murakami does that!) I hope I enjoy it as much as you did. Sounds intriguing Tony … but oh, dear, those names (says she with a Welsh middle name that I'm not sure how to pronounce). Like your other commenters here, I'm further inspired by your ref to Murakami.